God’s War by Kameron Hurley opens with our hero, Nyxnissa, who has just sold her uterus for petty cash and then blown it all on drugs and gambling. Then things get worse. This book picks up the reader and drops them onto an alien planet, thousands of years in the future. It is a world where technology is powered by genetically engineered bugs and the colonists are tearing their world apart to fight a holy war, the origins of which no one quite remembers. All the men of Nyxnissa’s nation are drafted into the army. Women are allowed to volunteer. Nyxnissa served her time on the front, and came home a hero, with a body covered in burns. Once the magicians — this book’s practitioners of the Sufficiently Advanced Technology — finished putting her back together, she joined the bel dames, an order of sacred assassins who hunt down deserters in the name of God and the Queen. She isn’t particularly successful at it. When she’s offered a job that promises to shake all the vultures off her back, she has to take it, no matter how low her odds of surviving it seem to be. The other protagonist in God’s War is a young man name Rhys. What terrible thing drove him over the border to Nyx’s country, which is not a safe place either for foreigners or beautiful men, is revealed slowly over the course of the book. He is as close to a pacifist as anyone can be in war-torn Nasheen, and as close to a romantic interest as Nyxnissa is capable of having. While it is unmistakably science fiction, this book’s form reminds me of some of my favorite urban fantasy. The focus stays on Nyx and her band of hired misfit. None of them can afford to worry about interstellar politics or the power struggle between the Queen and her bel dames. They’re too busy trying to and take care of the people they love. Some romance has been waved in the direction of this book, but thankfully it is not allowed to dominate the narrative. This book is brutal. Everyone and everything in Nyx’s world has scars from the war. The author is unflinching in her descriptions of violence. I’ll admit to skimming some of the more graphic passages. I’d hesitate to call it gratuitous, though. Hurley understands that the life of a woman who collects blood debts is not one awesome shoot-em-up adventure after another. In the course of the book, Nyxnissa is broken down to the last slivers of her character. Her choices would not make sense without the violence that surrounds her. God’s War runs for quite a while before it tells the reader what it plans to be about. I did not mind that, because I was too wrapped up in watching Nyxnissa as she struggled to survive from one day to the next, as she tried (and inevitably failed) to stay ahead of the people who hated her. By the time the book gets around to mentioning the starships, the aliens, and the effects that three thousand years on an alien planet have had on its human population, they were just another set of interesting details added to the plot that had already sucked me in. Islam permeates every part of God’s War. I don’t recall another work of science fiction that featured a planet that was not only colonized by Muslims, but by waves of different Muslims of different ethnicities and traditions. The religions in God’s War seem rich and detailed to me. I would be very interested to hear the reactions this book gets from its Muslim readers. Now I am trying to find time to reread this book. I was not completely sold on the way it ended the first time around. As time has passed, though, I find myself growing more and more attached to God’s War. I’m glad I had a chance to read it, and I recommend it highly. God’s War is a fine piece of writing, and not one that its readers will easily forget. 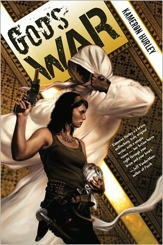 Kameron Hurley and God’s War were featured on John Scalzi’s The Big Idea series.